This will be the largest electric vehicle ever made. Last year, Elon Musk released the second half of his Master Plan, which was strongly anchored in creating a more sustainable future for our planet. It included plans to create a solar roof with seamlessly integrated battery storage, improve driverless vehicles, and expand its electric-powered product line. Included in the last piece of the plan is the development of electric semi-trucks. 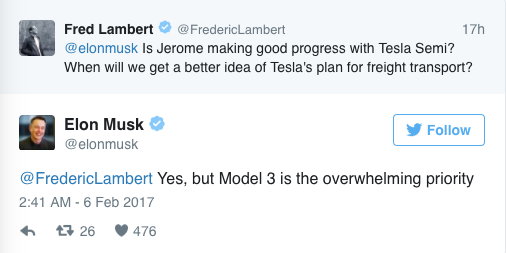 Today, Musk has assured the public via Twitter that Tesla’s semis are well on their way. However, as the Tesla Semi becomes a reality, the Model 3, a new Tesla car design slated for a 2017 release with over 400,000 reservations behind it, remains Tesla’s priority. Nevertheless, despite the company’s current main focus, the Tesla Semi is apparently already in “early development work,” reports Electrek. One of the biggest challenges that Tesla might face in bringing these large, battery-powered trucks might be their size. So far, we have seen Tesla’s current technology work exceptionally well for compact cars and sedans. But modifying this technology for heavy trucks designed to carry cargo and drive long-distance means that Tesla will most likely have to significantly adjust charging mechanisms, drastically increase the energy-capacity of its batteries, and work to make the vehicle lighter overall. But, since Tesla is one of the most forward-thinking and innovative companies of our time, it’s probably only a matter of time before we see the inventive new ways that they will address these challenges.